In the Officiating Standards, it says that when a Skater has fouled out, the PBT times the empty chair and that "The chair should be marked in a way that it is clear to other Officials that the chair is being timed." I know a pylon or a towel can be used. Does anyone do anything different? 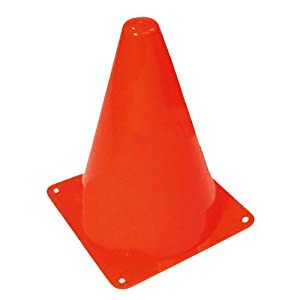 We use a small orange cone. I believe we've used these smaller, softer cones. Seems safer. But I've also seen small pillows or even hats used. I have more than once used a water bottle, because nobody remembered to put a cone in the box before the game. Not ideal in terms of visibility but does the job. I have more than once used the PBM whiteboard as a marker because it was what was to hand. My absolute favorite, however, is the situation at Cornfed, where the NSOs are setup in a minature golf course adjacent to the roller rink. It's a pretty sad little course, with ceramic chickens and pigs passing for "hazards."